Many years ago I took a week long pastry class at Le Cordon Bleu and one of the first things we made was this Fruit Tart. Once I returned home, it didn't take long for this dessert to become one of my family's favorite. This classic tart has three components, a fluted edged sweet pastry crust, a luscious pastry cream, and glistening rows of fresh fruit. It looks enticing whether you use a single fruit or a medley of fruits and berries. 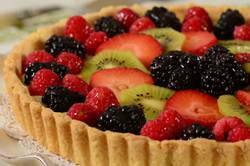 While the components of this Fruit Tart can be made a day or two in advance, it is best enjoyed the day it is assembled. The cookie-like pastry crust, which also goes by the name Pate Sucree, has a sweet flavor and a crisp texture that is the perfect vehicle for holding the pastry cream. The crust is pre baked and once baked and cooled, I like to seal the crust by spreading on a thin layer of apricot glaze. This 'sealing' prevents the filling from softening the crust over time. The classic filling for a fruit tart is pastry cream, or creme patissiere, which is a rich, thick custard made from a mixture of milk, vanilla, eggs, sugar, flour and cornstarch (a thickener) that is cooked on the stove. It can be made a few days in advance so the only thing you need before assembling the tart is a quick whisk to get rid of any lumps. Of course, the first thing you notice about a fruit tart is the fruit. The fruit can be arranged in concentric circles or rows, or it can be randomly piled on the cream. There are so many fruits to choose from but it is important that the fruit looks and tastes its best. While berries, with their vibrant colors, are always popular, other fruits are nice as well. Slices of kiwi, pineapple, melon, peaches, plums, nectarines, and mango are some fruits that work well. If you like, you can glaze the fruit with either an apricot glaze (recipe included) or red currant jelly (for red colored fruits) to give the fruit a beautiful shine and it also prevents the fruit from drying out. Meanwhile, in a saucepan bring the milk and vanilla bean just to boiling (just until milk starts to foam up.) Remove from heat and add slowly to egg mixture, whisking constantly to prevent curdling. (If you get a few pieces of egg (curdling) in the mixture, pour through a strainer.) Remove vanilla bean, scrape out seeds, and add the seeds to the egg mixture. (The vanilla bean can be washed and dried and placed in your sugar bowl to give the sugar a vanilla flavor.) Then pour the egg mixture into a medium saucepan and cook over medium heat until boiling, whisking constantly. When it boils, whisk mixture constantly for another 30 - 60 seconds until it becomes thick. Remove from heat and immediately whisk in the liqueur (if using). (Stir in vanilla extract is using instead of a vanilla bean.) Pour into a clean bowl and immediately cover the surface with plastic wrap to prevent a crust from forming. Cool to room temperature. If not using right away refrigerate until needed, up to 3 days. Beat or whisk before using to get rid of any lumps that may have formed.